Join Bluedog Photography on a photographic journey to Birdsville and the Far West Outback. This tour is perfect for keen photographers eager to explore and capture the unique qualities of incredible destinations. Professional photographer of 30+ years, Danielle Lancaster will be your host and tutor. Arrive Longreach via Qantas Link or the Spirit of the Outback rail journey – we’ll be there to welcome you and transport you to our accommodation. Rest or explore Longreach. Enjoy a welcome dinner and tour briefing at your motel. We travel to Winton this morning visiting the tranquil Lilly Lagoon along the way. Winton is best known as the home of our unofficial anthem ‘Waltzing Matilda.’ Visit the famous North Gregory Hotel where this most loved song was first played and explore the Waltzing Matilda Centre, the only museum dedicated to a song (optional cost). While in Winton we’ll also see the quirky Arnos Wall and you’ll have time to wander the main street opal shops and meet the locals. Enjoy lunch then check-in to our accommodation. Early afternoon we travel to the Australian Age of Dinosaurs, perched on a majestic mesa just a short drive from town. Here we’ll join a tour of the collection room and laboratory before our exclusive sunset barbeque overlooking the plains where dinosaurs once roamed. It’s an early start this morning, but you’ll be well rewarded capturing some amazing sunrise shots at the jump-up (mesa) region of Rangelands Station. Discover intriguing narrow rift formations carved out by mother nature. After breakfast, we begin our drive to Boulia through some incredible mesa country including Cawnpore Lookout with its 360-degree views over the Lilleyvale Hills. We’ll call into Middleton and the Middleton Hotel, population two, to share a yarn and lunch at one of the most isolated pubs in Queensland. Our afternoon destination is Boulia, best known for a mysterious hovering light – the Min Min Light. First spotted above the Min Min Hotel ruins in 1918, there have been countless sightings over the last 100 years. You have the option (addition cost) of visiting the Min Min Encounter Centre for an entertaining high tech presentation of local Min Min stories. Visit the Stonehouse Museum, one of the first houses built in Western Queensland. Meet for a memorable sunset at Boulia’s famous windmill. Depart Boulia and head off to Birdsville, located amongst some of the toughest country in the heart of the Lake Eyre Basin. Travel across the vast Cuttaburra flood plain and onto Bedourie for lunch. We’ll see ancient Waddi Trees found in only 3 places on the planet. The species is so old it has survived since the ice age. We will make stops for plenty of other photo opportunities along the road and from lookouts. Arrive Birdsville by mid-afternoon to check into the Birdsville Hotel. We celebrate happy hour on top of amazing red dunes at the edge of the Simpson Desert National Park. Be a part of the experience and feel the very soul of Australia as the sun goes down over the heart of the Outback. After, we will head back to the Birdsville Hotel for dinner. Enjoy an easy morning discovering the icons of Birdsville with us. Check out the Burke and Wills Tree on the Diamantina River. We’ll stand on the border of South Australia and Queensland, located on the famous Birdsville Race Track. After we will visit the Wirrari Centre and then the Birdsville Hotel for Lunch. Mid-afternoon we head to Carcoory Ruins for a night shoot of the amazing outback sky. Rise early and explore the town of Birdsville at sunrise. You will find the ruins of the old hotel, the Inland Hospital, a Billabong alive with birdlife, the hydro bore and more attractions all in walking distance to the hotel. We are planning a portrait shoot of a local if it can be arranged. After lunch, enjoy some leisure time to focus on tracking down that iconic Birdsville image or take a break. Enjoy happy hour at the Birdsville Hotel where you will experience a whole lot of outback character. After dinner, we wrap up the essence of Birdsville with a Royal Flying Doctor Auction at the Birdsville Hotel. This morning depart for Windorah. Follow the incredible sand dunes and gibber country to the old abandoned Betoota Hotel and Deon’s Lookout for spectacular views of the Diamantina Shire. Take in the sunset on the dunes outside Windorah. Today we travel northeast alongside the mighty Thomson River towards Longreach, via Stonehenge and Jundah. This evening soak up a spectacular outback sunset with the Drover’s Sunset Cruise. Sit back and be charmed by our outback entertainers and savour the traditional flavours of our camp oven inspired modern cuisine. Depart Longreach for your transfer home after a journey of a lifetime in Outback Queensland. 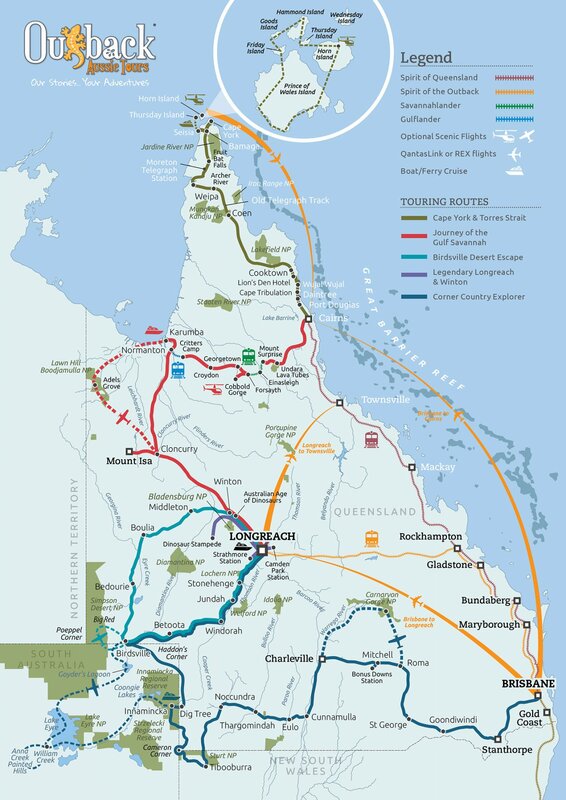 Bluedog and Outback Aussie Tours reserves the right to change the proposed itinerary if necessary. This was an amazing experience, I can’t thank you all enough. I loved the Outback Adventure and look forward to doing more trips with Bluedog. I was interested to learn more about the outback and that I did, I still can’t believe the opportunities we had. Danielle and Mim gave us lots of information. And of course the photography advice and assistance. I got my bucket list shot! Thank you!